MANHATTAN, NEW YORK- Day one of Club Sevens National Championships was filled with twists and turns with several heavily favored teams failing to qualify for the Cup Quarterfinals. Both the Men and Women combined to provide spectators with some memorable clashes and set the stage for an exhilarating championship round. One of the most surprising and suspenseful pools of the day came from the men's Pool A. Going into the day pundits thought that it would have been between 8-time runner up Denver Barbarians and Mystic River Rugby to claim the top spot. A spanner was quickly thrown into the works when,in the first game Atlanta Old White tied with the Barbarians and put the rest of the pool on notice. However, while they were quick out of the gates, Old White couldn't capitalize and dropped their next two games and fell to the bottom of their pool. Mystic River, the other favorite to win the pool, started hot and finished hot. Led by Jeron Pantor, who scored at will over the course of the day, the Massachusetts men put the rest of the competition on notice. The Barbarians recovered from their slow start to beat Belmont Shore Gold, to set a date with Mystic to determine who would go through as the number one seed. The inconsistency that had plagued them all day came back to haunt them at night and a winnable game for the Barbarians slipped away from them. However, they'd done enough to secure the second seed in the pool. As Mystic and the Barbarians head into their fixtures tomorrow, Mystic will be looking to recapture the magic; while, the Barbarians will be hoping the rust is out their system. Washington Athletic (WAC) came into the tournament tabbed as a team likely to walk away with it all come Sunday. On Saturday, they proved their believers right. They showed an attacking flair that few teams could match, while also showing off a resiliency in defense and a stubbornness that will serve them well the deeper they venture into the tournament. Joining them at the top of their pool was Metropolis Rugby, who if it hadn't been for a brilliant individual effort at the end of the game from WAC's Shane Moore could have taken the Pool B title. They were locked in tight matches throughout the day but, with the exception being their game against WAC, found a way to pull out a victory. New Orleans and Santa Monica both displayed moments of brilliance but unfortunately, they were few and far between. New Orleans, ultimately proving the be the stronger of the two sides when they held on late in their fixture to lock up the third seed in their pool. Old Blue of New York, the hometown heroes, put on a spectacle for their fans on the opening day, going undefeated and showing all of the hallmarks of a championship caliber team. Led by their Eagle, Connor Wallace-Sims, Old Blue left their opposition in a daze, using their blinding speed on the outside to burn their opposition. While using their big bodies, like Phil Salter, in the middle to wear them down physically. They were seen as a strong chance for the title heading into pool play, and all they did was solidify their position as a contender. Their pool rival, Dallas Reds, were seen as a popular 'dark horse' pick to be crowned champions, and they proved that they should be more than just an outsider's pick early on. Led by Narada Jackson the Reds, played an exciting brand of rugby. With less than ideal weather conditions their full effect could not be demonstrated, but they laid a platform from which they can build and pose as a threat to others around them. Kansas City Blues and the Cleveland Academy pushed their opposition to the brink all day, but never quite had enough to claim the big game victory they need to advance in the championship bracket. The Blues let out some pent up frustration out on Cleveland in their final game of the day, and proved they could be a chance for the bowl tomorrow. Young teams playing in big tournaments are always seen as an exciting prospect, but many doubt their ability to pull through in the big moments. The youngest team in the competition, Bulldog Rugby, quashed any ideas that they weren't going to perform in the big games. Running through their pool amassing an immense point differential of plus sixty-four points. The man behind their excellence, was Lindenwood standout, Christian Rodriguez. He pierced any gap presented to him with precession, and even when there were no gaps available he created ones himself. They never shied away on the big stage and proved that they are not to be taken lightly going forward. Standing in Bulldog's way was Belmont Shore, a more mature team that was the hot pick to win it all. They showed glimpses of brilliance in their opening games, but were off kilter in their matchup with Bulldog, in the pool deciding game. If Belmont is going to prove their fans right, they will need to iron out the sloppy mistakes that plagued them in their final encounter. Beltway Elite and New York Athletic, while strong outfits, were overpowered by both Bulldog and Belmont. They had chances throughout the day but ultimately left them behind. It was a day neither would care to remember, but put their pedigree on full display tomorrow. Life West Gladiatrix have been untouchable throughout the year, and many expected them to be in strong form this weekend, not many expected them to blow through their Pool in the fashion that they did. Sarah Buonopane, one of their many Eagles, the Gladiatrix stifled teams in defense and attacked with precision. They cemented their spot as the team to beat heading into the quarterfinals tomorrow. The Rocky Mountain Magic, lived up to their name by qualifying for the quarterfinals after the hooter had sounded in their final game of the day. An unknown commodity heading into the weekend, as they had only played three games in their season, they proved to be a tough beat and hung around teams that few thought they could. The Magic will hope the spell can continue to last and take them further into the depths of a National Championship hunt tomorrow. 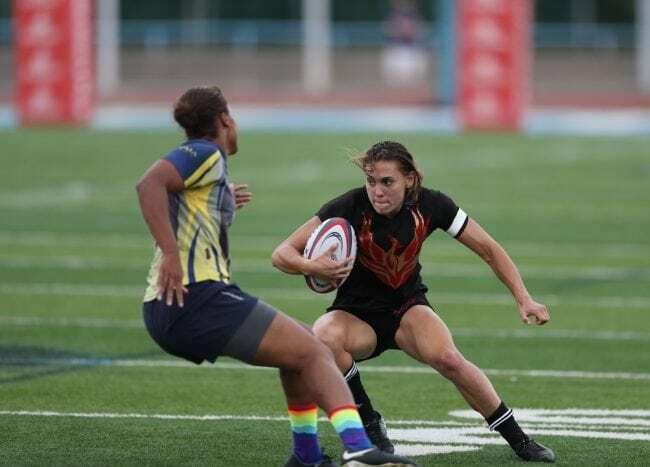 Phoenix Rugby and the D.C. Furies, will be left feeling disappointed. Not because of their play, but rather they because they didn't get more of result for the strong performances they turned in. Both teams played consistently strong rugby throughout the day, but given the nature of sevens sometimes its not enough. Both teams should be seen as a threat to claim the bowl tomorrow. California dreaming, was the story of Pool B on the opening day. The San Diego Surfers, last year's runners-up came in as a strong favorite, with their spattering of capped Eagles, and their historic prowess. In three games they put up eighty-nine points, while conceding five. They were leaps and bounds ahead of their pool partners, and left the rest of the competition with a feeling of unease. The Berkeley All-Blues came in with a history of success in 7s, but inconsistent performances in the past also prevented pundits from investing too heavily in their stock. If they weren't buying before the tournament, they certainly were after done. The women from Northern California were electrifying all-day and while they did succumb to the Surfers, it had been the All Blues of yesteryear that arrived in New York this weekend. Chicago, were perhaps unlucky not to advance into the Championship rounds. They held their own throughout the day but costly mistakes and lapses mentally cost them a chance at really showing their true potential. American Rugby Pro White, showed sparks of inspiration, but ultimately, due to sustained lack of possession were unable to spark it into results. 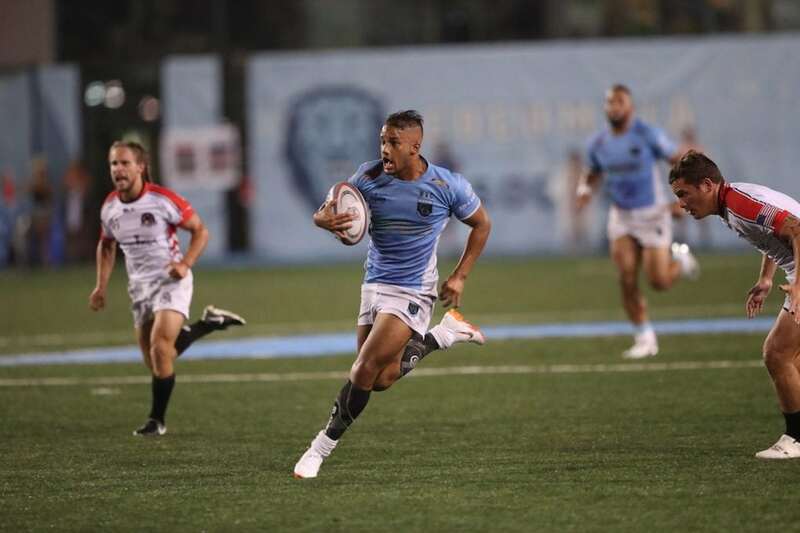 Going into the weekend New York Rugby Club (NYRC) had not lost a game all sevens season, and they extended their winning streak again on Saturday. It was not always easy for the crowd favorites, but they were able stomach the blows they were dealt and mitigate and damage. Ultimately outlasting teams and excerpting their dominance over the home stretches of their games. NYRC's main rival for the pool title, going into the weekend, was considered to be Washington Athletic. However, it turned out to be Atlanta Harlequins that moved on from the pools. The Harlequins pulled off two straight last minute moments of brilliance to secure their place in the championships playoffs. The first was a fifty yard dash that saw them squeeze past WAC for a one point victory and then sustained phase play against Northern Virginia that saw them seal the game. Their ability to hang around late in games served them well today and if they can repeat it tomorrow they'll be able to push for a podium finish. WAC and NOVA both played better than their respective records suggest. They will be hungry to prove themselves on the national stage tomorrow and get results that more accurately reflect their level of play. In a three-way tie for two spots, someone was always going to be left out in the cold. For Boston, they were the unlucky team to miss out. Scion Sirens ended up on top of the pool, after an initial hiccup against Boston, where they blew a 17-point lead. After the first loss they then came out and dominated the rest of the pool, and more than made up for their slow start to the game. They went from looking as if they were on a road to leaving early, to being one of the most dangerous teams in the league. The second spot went to American Pro Blue who, along with the Sirens look to be a team destined for a top three finish. They won their first two games, but then were blown away by a highly motivated and invigorated Sirens squad. The loss was not how they wanted to end the day but shouldn't take away from their stellar performances over the day. Boston looked destined for greater things but they couldn't capitilise on their hot start to the tournament and a heavy loss to ARPTC cost them dearly in the long run. Metropolis were unable to string consistent passages together and while they showed glimpses of how far they could reach they unfortunately were too far and few between.